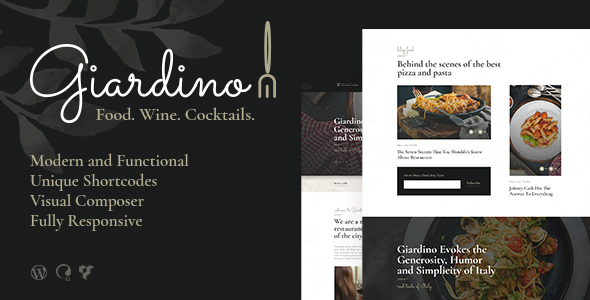 Giardino is a modern, clean and fresh WordPress theme. It is what you actually need to make an impressive online presentation of your beautiful Italian restaurant, cafe, bar, catering service, diner bakery, brewery business and so on. It is great for any cuisine: asian, european, japanese, chinese, korean, etc., as it covers most of the menus (meat, seafood, rolls, sushi house, fish). With our theme you are able to showcase the menu of your restaurant, displaying description, price, ingredients, dishes and nutrition. Also, visitors can easily make reservations right through the website.